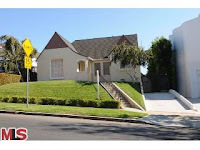 It seems that I have to keep repeating this post as this Westwood home at 10674 Rochester Ave., LA CA 90024 returns to market this week for another try at selling. The new listing price of $1,149,000 is $24,000 higher than the last time it was on the market, a 30 days stint in January 2011. The property has been off an on the market since 9/18/08, when it started with a list price of $1,595,000. Since that 2008 listing period, there has been 7 listing periods and 7 or so price reductions. This property is a classic example on how overpricing your property to start with and chasing the market down, will eventually lead to a much lower sales price. While I can't guarantee it, I am almost certain the owner would have got a much higher sales price back in 2008 or 2009 if they started closer to this number than the $1.595 price. The property was last purchased in 2004 for $1,150,000. According to the MLS, the home is a 3 bedroom / 1.75 bath, 1,656 sq ft on a 6,500 sq ft lot.